Get ready to putt among animated barnyard animals, waterfalls and other interactive elements at Ripley’s Old MacDonald’s Farm Mini-Golf! There are three amazing courses to explore with a total of 54 holes, so you can play one round or sample them all! This location also features the Super Fun Zone Arcade, where you can play video games between courses and turn your visit into an entire day of fun. Ripley’s Old MacDonald’s Farm Mini-Golf gets rave reviews from miniature golf fans for its unique theme and challenging holes, so be sure not to miss this one! If you have ever wanted to join an archaeological expedition of searching for ancient gold and diamond mines, now is your chance with Professor Hacker’s Lost Treasure Golf! Begin your journey by riding a mine train to the first holes, then set off on an adventure through a temple, volcano, pirate ship and waterfall in your quest for treasure! These two incredible 18-hole miniature golf courses are based upon the fictional archaeologist Duffer Hacker, who spent his life searching for treasure off the coast of South America. So grab your putter and get ready to set off on an exciting mini-golf adventure of your own! Prepare to experience a world of enchantment among dragons and castles at Fantasy Golf, one of the longest running courses in Pigeon Forge! This facility features two amazing mini-golf courses at one location, the challenging Dragon Course and the family-friendly Viking Trail. The Dragon course offers plenty of tricky obstacles that are sure to challenge even the best golfers out there, while the Viking Trail’s flat course is perfect for younger kids who are playing for the first time. Experience an unbelievable game of the best miniature golf in Pigeon Forge right at your cabin – at Mountain Top Retreat! This massive 8 bedroom cabin from Large Cabin Rentals features an entire 18-hole themed miniature golf course on the lower floor! Imagine the excitement of strolling downstairs in your private cabin to enjoy a fun round of mini-golf at any time of day! There is no need to spend time in lines waiting for others when you have a putt putt golf under your roof. 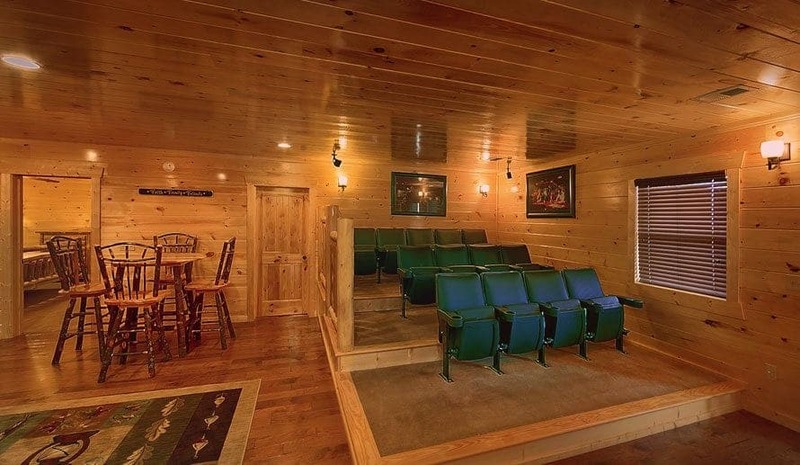 If that wasn’t enough, the Mountain Top Retreat also features a 14-seat movie theater room which makes this the ultimate cabin for entertainment lovers! Book the Mountain Top Retreat or any of our cabin rentals in Pigeon Forge today to challenge the best miniature golf in Pigeon Forge! We look forward to your stay at Large Cabin Rentals!